I don’t do fancy stuff for breakfast. Seriously. Some people might look at my Breakfast posts and disagree, but as I explained in my Cherry Sour Cream Scones post, most morning meals are simple with just fruit and grains of some sort. With three little boys to get going in the mornings, I don’t have the luxury to make extravagant breakfasts. Though I dearly love cinnamon rolls and could eat them every single morning, I reserve fancy things like that for special occasions such as Christmas or when we have family visiting. Actually, that’s probably a good thing because all that butter and sugar goes straight to my backside. If a particular ingredient was unavailable or cost-prohibitive in our region, then we could substitute. Since I’m not a sticky buns fan, I decided to skip those and just make the cinnamon buns. The recipe does list a few options for some of the ingredients, so I’ve written the recipe the way I made it. 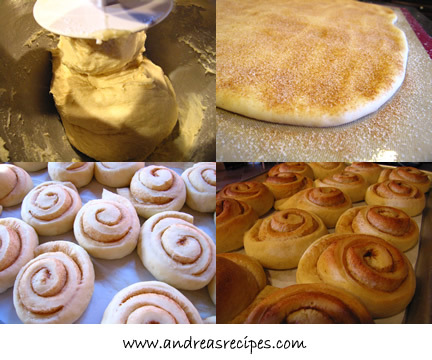 For the full recipe and all the variations, including instructions for making the sticky buns, check out Marce’s blog. One thing that I’ll be straight up about is that I only made half of the glaze and found that it was plenty for a batch of buns. We made 16 smaller buns, but even they were still a couple inches in diameter, so unless you just like humongous pastries, you can probably make 12 to 16 buns out of the recipe and no one will feel like they were cheated by a too-small bun. The dough is soft and lovely to work with, and has a light, interesting flavor, and the buns were popular around the neighborhood, but overall I think I prefer the family recipe (sorry, Peter). The main difference between the two is the filling: Reinhart’s recipe uses simple cinnamon sugar in the middle layer, while our family recipe calls for butter, brown sugar, cinnamon, raisins, and chopped nuts. We just happen to prefer gooey, loaded cinnamon rolls, and I will post that recipe as we get closer to the holidays since that’s when we typically enjoy them. 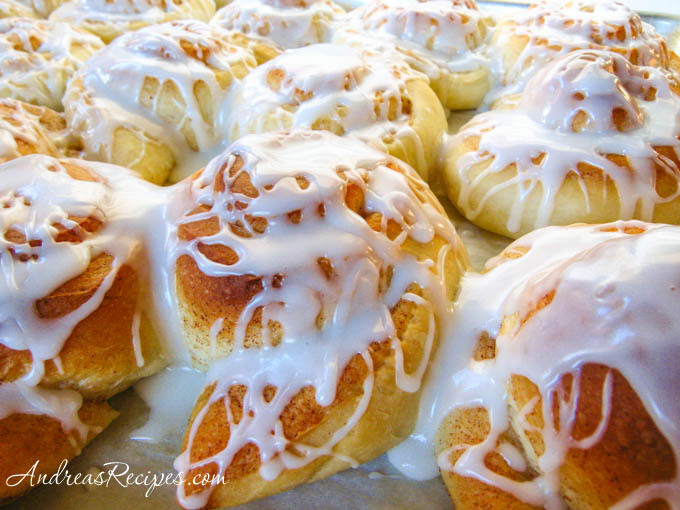 Make sure you hop on over to The Daring Bakers Blogroll and check out all the beautiful buns! 1. MAKE THE DOUGH: In the bowl of the stand mixer and using the paddle attachment, cream together the sugar, salt, and butter, until light and fluffy. 2. Add the eggs, one at a time, and mix thoroughly. Add the lemon extract/zest and mix until combined. 3. In the small bowl, stir together the flour and yeast, then add to the butter mixture and stir. Add the milk. 4. Mix on low speed until the dough starts coming together in a ball and clears the sides of the bowl. Switch to the dough hook, and knead on low for about 10 minutes, until the dough is smooth and supple, not sticky. If the dough is too sticky, add a tablespoon or two of flour. If the dough is too dry and shaggy, add a tablespoon of milk. 5. Transfer the kneaded dough to the oiled large bowl, and spray a little cooking spray over the top of the dough. Cover the bowl with plastic wrap and set aside in a warm location to rise until doubled, about 2 hours. 6. SHAPE THE BUNS: Move the dough onto a silicone pastry mat or mist some cooking spray on your work surface, then roll it out into a rectangle about 2/3-inch thick. Lightly dust the top of the dough with flour while you work to keep the rolling pin from sticking. If you want 12 to 16 buns, then make the rectangle 9 inches by 18 inches. If you want 8 buns, then make the rectangle 12 inches by 14 inches. 7. Sprinkle the cinnamon sugar on top of the rectangle, then roll the dough into a log. Cut the log in half, and then half each piece again. Continue cutting until you have the desired number of buns (8 to 16). 8. Place the cut buns on the parchment paper with about 1/2-inch distance between them. Allow the buns to sit at room temperature for up to 90 minutes, until the buns have nearly doubled in size and spread into each other. 9. BAKE: Preheat the oven to 350°F (175°C). Put the rack in the middle of the oven. 10. Bake the buns for 20 to 30 minutes, until golden browned. Remove from oven and allow to cool in the pan for 10 minutes. 11. MAKE THE GLAZE: While the buns are baking, stir together the powdered sugar, extract, and milk in a small bowl. Whisk until the mixture is smooth and thick. 12. Drizzle the glaze over the tops of the buns while they are still warm. Remove buns to a cooling rack and allow to sit for 20 minutes before serving. Your rolls look perfect! We perfer a loaded roll in this house too. Damn you Cinnabon for ruining the simple cinnamon roll for all of eternity! Job very well done Andrea! Oooh, I liked these buns but I also really like the sounds of your family recipe so will be waiting anxiously for your recipe Andrea. And I’m with you – much as I love these for breakfast, with the kids and school, cereal is what it has to be. I also had to drastically reduce the amount of glaze, and even then I had loads. I like the sound of your family’s buns, with the butter in the middle, since i felt these could have used a bit more punch from the filling. Great buns, though! I’m with you – I prefer my usual recipe as well, but your buns look beautiful! I love your glazing! Wheeeeeeeew! Those are some incredible looking buns. Great job! Look at those! Great job Andrea! Wonderful looking rolls, your experience must have helped you make them turn out so great! Gorgeous buns! The photos are excellent. I, too, used to not be a sticky bun lover, but I did find that it was because some of the “topping” was too sticky, and caramelly without creaminess. The caramel on this recipe is excellent. Of course, adding butter makes it beyond description! You mean of course they go straight to my beautiful buns, right! Andrea your buns are picture perfect. I’m with you: more cinnamon, brown sugar, butter – I most always use dried blueberries (and soak them in wine). Your buns look so good and puffy. I agree the dough was a dream to work with and had a light flavour. Can’t wait to see your family recipe close to the Holdiays. Great job on this month’s challenge. Great job on your challenge. The buns look dreamy! So did you do anything differently while making them, since you had the three boys? Or did you have the chance to do it all in one setting? I halved the amount of icing too! You are so right! I can eat this everyday for breakfast and snacking. look at all those beautiful buns! i agree that a filling with brown sugar makes a much gooey-er bun, and always like to add nuts to mine, too. But your buns are supposed to go straight to your “buns”! That’s the beauty of them. Looking forward to your family recipe too. Jenny: It took me all day to make these! I usually reserve DB projects for evenings after the kids have gone to bed, but I just couldn’t get myself organized this week. So I had to jump in and make them rather last minute on Friday! Yum!! all of that yummy white icing looks delicious!!! Seeing everyone else’s buns makes me want to make more! Nicely done. Love your buns .. they look davine (sp)! As well, the cakes on your site are wonderful, especially like the applesauce one, I will have to try it out! Same here, three boys and all! Couldn’t get them ready for breakfast but they were delicious any time! Well done! I agree with Dharm – they look really professional! I’m with you Andrea, I missed the raisins in the cinnamon buns too. I’m glad you participated — sometimes it’s important to acknowledge that in some small way, *every* day is a special day. Great job on the challenge! I can’t wait to see your family recipe, it sounds delicious! Your buns look great! I can’t wait to hear the family recipe! It sounds like your family recipe is closer to Peter’s sticky bun version. In any case, your rolls look lovely and perfect for a more decadent breakfast. My breakfasts are pretty austere, too–oatmeal or yogurt with some add-ins. These would be great for a brunch party, though. They look so decadent! Hum, I would love these for a weekend breakfast, as during the week my breakfasts are just fruit, oat meal, yogurt and black coffee. They look great Andrea! Although I think your buns turned out lovely – I have to agree with you.. I would prefer the loaded ooey, gooey buns much more. PLEASE post yours – I’d love to see!! Andrea, I bet your family enjoyed this special breakfast treat! Beautiful!